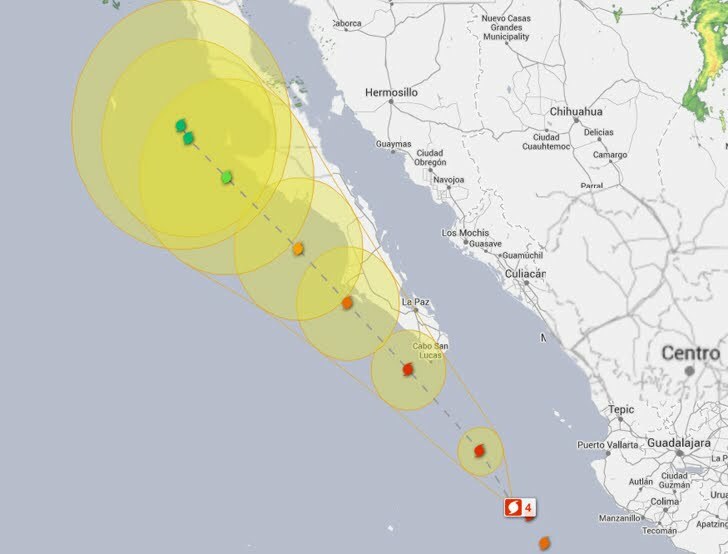 Category 4 hurricane Odile approaching the southern Baja California peninsula. 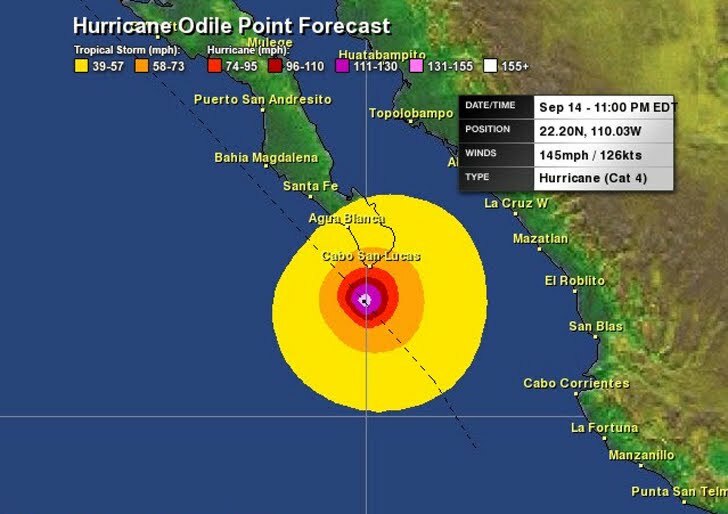 At 05:00 hr PDT the eye of Hurricane Odile was located about 360 km - 225 mi W of Manzanillo Mexico, about 460 km 285 mi SSE of the southern tip of Baja California. Odile is a category four hurricane on the Saffir-Simpson hurricane wind scale. Some additional strengthening is forecast before the hurricane nears the southern portion of Baja California sur. Odile is moving toward the north-northwest near 24 km/h - 15 mph. A general motion toward the northwest with an additional increase in forward speed is expected tonight through Monday. 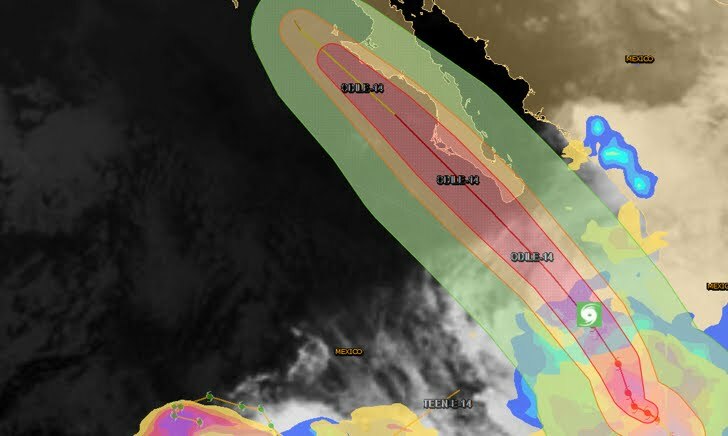 On the forecast track the core of Odile will remain offshore of the southwestern coast of Mexico this morning and then pass near or over the southern portion of Baja California sur tonight and Monday. Maximum sustained winds are near 215 km/h - 135 mph with higher gusts. Hurricane conditions are expected in the Hurricane Warning area beginning by tonight and are possible in the Hurricane Watch area late Monday. 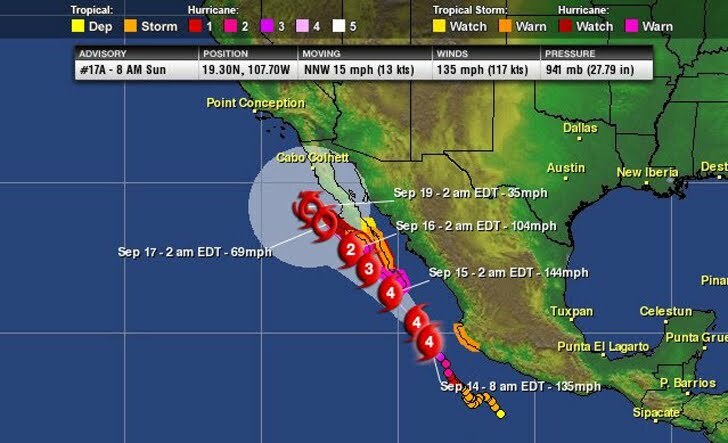 Tropical storm conditions are expected to spread northward across Baja California sur in advance of the hurricane conditions later today. Tropical storm conditions are possible within the tropical storm watch area by Monday night. Tropical storm conditions are likely occurring along the coast of Mainland Mexico in the warning area. Summary of watches and warnings in effect. The West Coast of Baja California sur from north of Puerto San Andresito to Punta Eugenia. The East Coast of Baja California sur from north of La Paz to Loreto. The coast of Mainland Mexico from Manzanillo to Cabo Corrientes. The East Coast of Baja California sur from north of La Paz to Mulege. The West Coast of Baja California sur from north of Puerto San Andresito to Punta Abreojos. The East Coast of the Baja California sur from north of Mulege to Santa Rosalia.